Allow me to take you on a virtual tour of my home city – in chocolate! I found this fabulous chocolate mould at a local supplier, and I’ve been playing around with it. 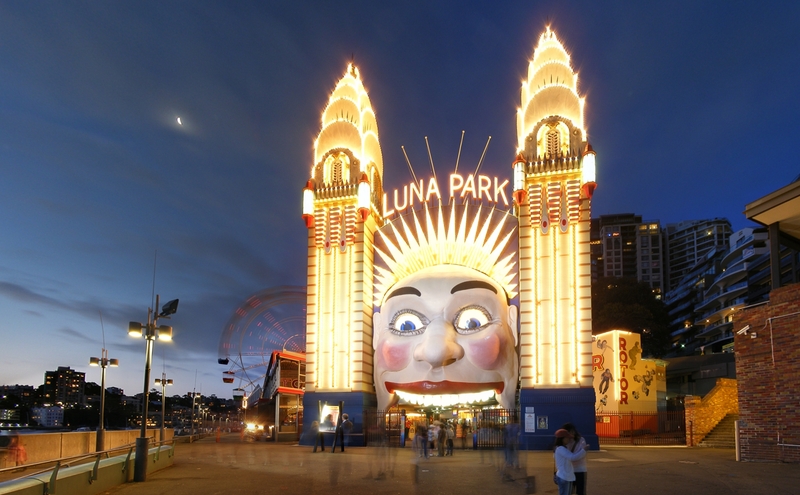 Luna Park..is just for fun! The most famous building in Australia – the Sydney Opera House – rendered here in Callebaut 811 dark chocolate. This magnificent landmark recently received World Heritage recognition as one of the architectural wonders of the world. Seeing it is one of my great joys whenever I’m in town. 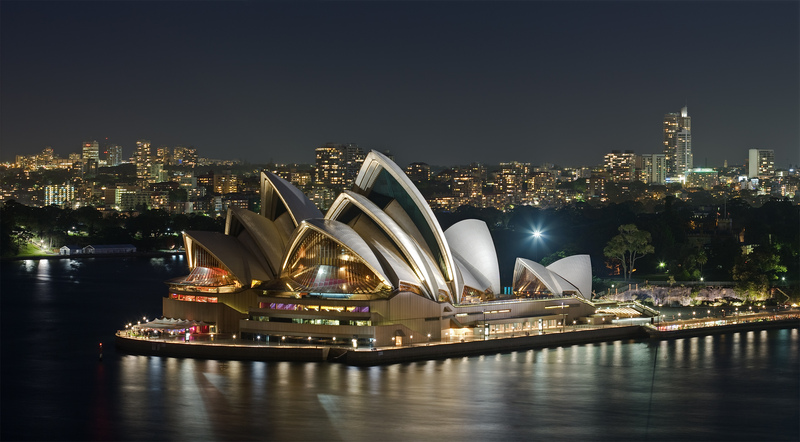 There’s more information than you ever wanted to know about the Opera House on their website. The Sydney Harbour Bridge, affectionately known as “The Coathanger”, is the world’s widest, and fifth-longest, spanning arch bridge. Opened in 1932, it provides a link between Sydney’s northern suburbs and the CBD. Here are some photos Small Man took a few years ago during an excursion into town…quite artistic for a (then) nine year old, don’t you think? Sydney Harbour is in constant motion – full of boats and yachts, including the Sydney Ferries, HarbourCats and sailing boats. In the photo below you can see a glimpse of how it all fits together – the ferries, Luna Park and the Bridge. And…don’t laugh…here’s my slightly tragic attempt at a chocolate diorama of Sydney Harbour. Oh, alright, go on then, laugh..my boys did..for about two seconds before they devoured these! PS. That’s a chocolate hydrofoil in the middle of the photo – not a whale! wow! i feel like i took a tour of sydney. my youngest brother is going there for his honeymoon in december. i will forward this to him and his fiance. Hahaha. I love it! Would it be Chocney or Sydlate? Thanks for the virtual tour of home. I do love Sydney. And Ithink your version is absolutely choctastic. There was also a chocolate Centrepoint Tower, but I don’t think it’s really that much of a landmark anymore! You are so creative and fun! Love your chocolate tour….and I can only imagine that you used the best chocolate that you can find on the market today!!!! Jude, thank you! I’m a bit fussy about my chocolate (to put it mildly), so whilst we don’t use the best on the market, we do always use the best we can afford! In this case, it was Callebaut 54% cacao dark, and a high cacao milk chocolate – Venezuela 43% origin chocolate from Belcolade. Edible art installation moment – you should do more! I really enjoyed the tour – thanks Celia! They look fantastic Celia. Where do you get your Belcolade chocolate from? My husband did a chocolate making course on the weekend and now he wants to play. CHFG, the Belcolade was a gift from a friend, not sure where he got it from, but the Callebaut is available in 2.5kg bags from Chefs’ Warehouse. You can also buy small quantities of Cocoa Barry Tanzanie origin 75% from Colefax Chocolates in Haberfield (it’s an expensive option though, if your hubby wants to make a lot of chocolate!). Chefs’ Warehouse has Callebaut Milk, White, 54% dark and 70% dark in 2.5kg bags for under $50 each, which is the cheapest way I’ve found to buy really good couverture chocolate in bulk. The Callebaut milk is very nice, and what we usually use here. great post, celia! i’ve very much enjoyed it. makes me sorry i didn’t push harder for moving to australia last summer. although we would have gone to melbourne. either way, yay for chocolate! funny kid, your son. Very cute, Celia. Surely you could have covered your table with chocolate in the last picture! I’m also quite impressed with the pictures Small Man has taken – I don’t remember knowing anything about cameras when I was nine. Ooh new pictures in your header! I like them, aren’t they gorgeous? Lorraine, there were also chocolates with surfers and sailboarders on them, but they weren’t terribly photogenic! That is super Celia. There should be a link from Australian tourist board website to this post. You could be responsible for a whole upsurge in visitors seeking out the chocolate bridge, the chocolate opera house! I wish I could go to Sydney someday, but this choc tour was already awesome! I love this tour. I’ve learnt more about Sydney through your chocolate tour than I did. I used to know only the Opera house :-). Waw,…how cool is that!!! Sydney in chocolates!! They only do that in Brussels with Manneken Pis! How wonderful – I spent a few days only in Sydney when we were working our way around the East Coast well over a decade ago now. I loved it but am now feeling hard done by that we didn’t get to have the tour in chocolate. What a completely fantastic idea – I think you should market it and make a fortune – what visitor wouldn’t go for this? Hahaha…don’t feel ripped off, Sydney’s pretty special, even without the chocolate! Celia your Sydney in Chocolate feature is fantastic! I’ve been looking everywhere for similar moulds hence how I came upon your site. (though of course I’ve now subscribed!) In particular, I’m looking for the Opera House mould. Would you mind letting me know where you got them? Thanks!